Photo - Paper Insert Pens Custom Printed in Bulk or Blank. Promotional, Inexpensive, Large. Bargain Prices for USA and Canada. Our Bulk Photo -Paper Insert Pens are personalized with your large full color custom imprint. A vinyl insert, custom imprinted in full color, is inserted under a large clear barrel. It also features a colored grip and clip with matte silveraccents. We also supply blank (not imprinted) paper insert pens for $1.35 each (minimum 150), so that you may personalize them yourself. Blank vinyl Insert is included. 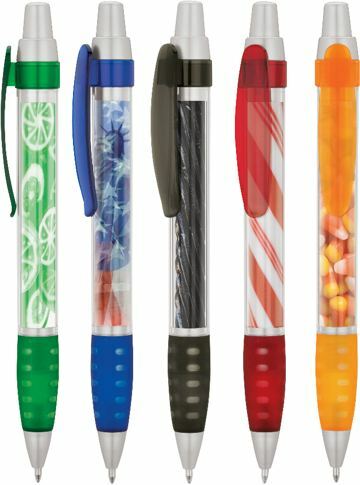 Lowest prices in USA and Canada for wholesale paper insert pens. American clients pay no taxes. Free artwork design. We will send you a proof for your approval before production. Refillable; Refills are available for $0.25 each. Production Time 5-7 Working Days (After artwork approval); blank insert pens ship next day. Prices below include your full color custom imprint over a wide area: 2 5/8" W x 1 3/16" H. We also supply pens with blank paper inserts for 1.35 each (minimum 150), and without the Setup Charge. Refills are available: $0.25 each. Setup charge: $55.00 per order. Production Time: 5-7 days after art approval; contact us for faster delivery; blank items are shipped next day.